Every once in a while, a kitchen upgrade is in order. And when this time comes, the latest in top-notch hardware as well as tough finishes would make the corroded, dripping and leaking faucets only memories of the past. So, choosing from some of the best kitchen faucets will make your upgrade complete. A good faucet can make all the difference on how beautiful and elegant the kitchen can look like. Knowing the fact that the kitchen is the most important part of a home, kitchen faucet could act as the centerpiece of it. Finding the one that fits the role of the center of attraction must be considered. **Below, you'll find my more detailed reviews about the kitchen faucets, but you can also click the links above to see current prices or read customer reviews on Amazon. What Are The Parts Of The Faucets? What Are The Common Faucet Problems? For simple selection, reviews of the best kitchen faucets play a major role in the choice. 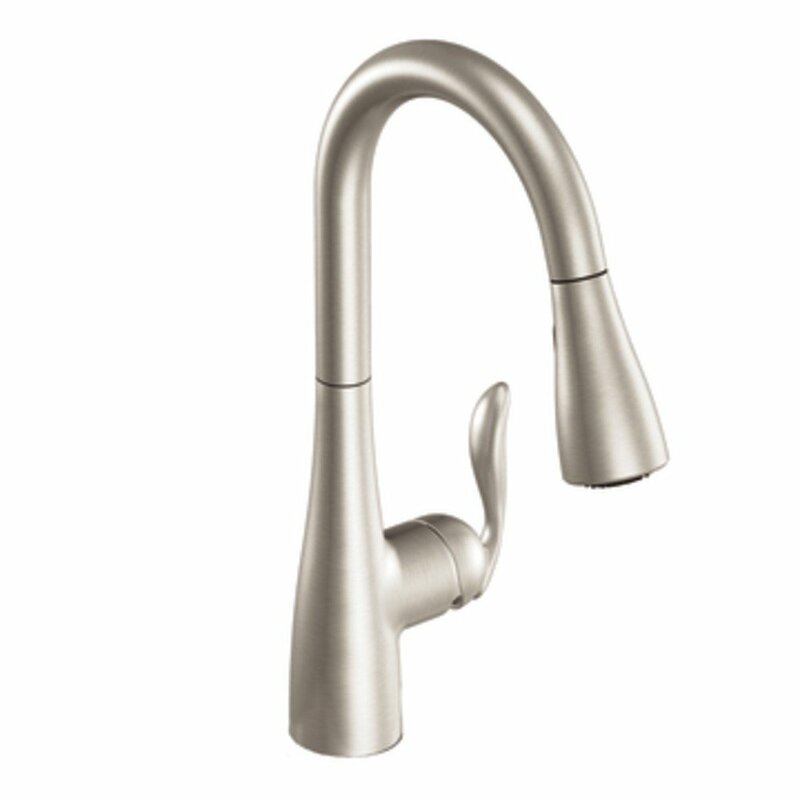 For easier kitchen faucet use, Delta Faucet 9178-AR-DST and Moen 7594SRS Arbor's pull-down design would be an advantage for every home kitchen. 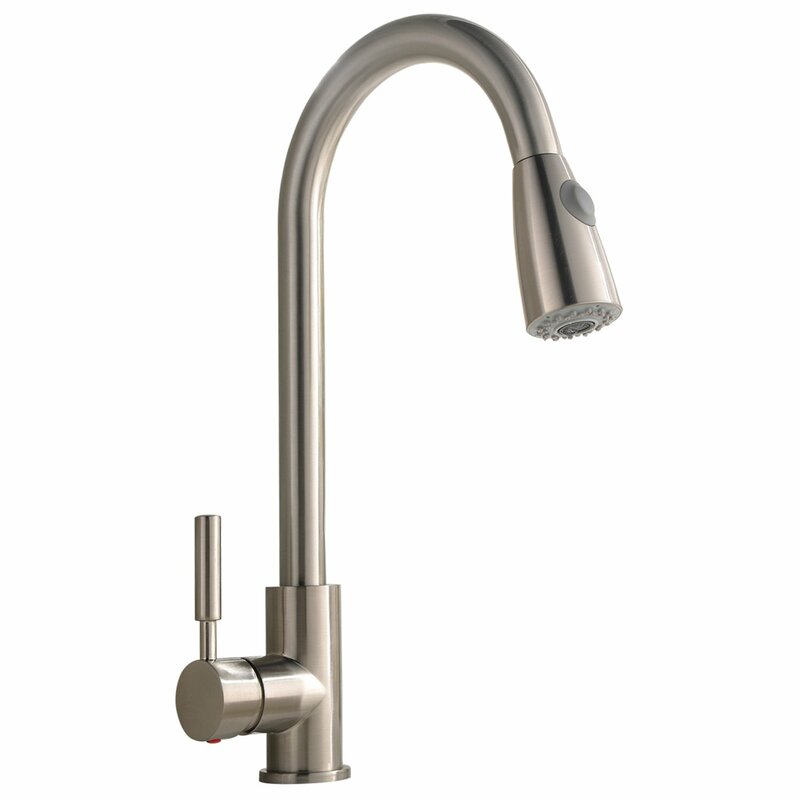 Delta Faucet 9178-AR-DST can be available in various colors. This is one of those pull-down kitchen faucets, which comes with favorable kitchen functionality and design. Its teapot design could not be perceived so inspiring for the preference of some homeowners, but judging on how it looks like, the faucet is very appealing. 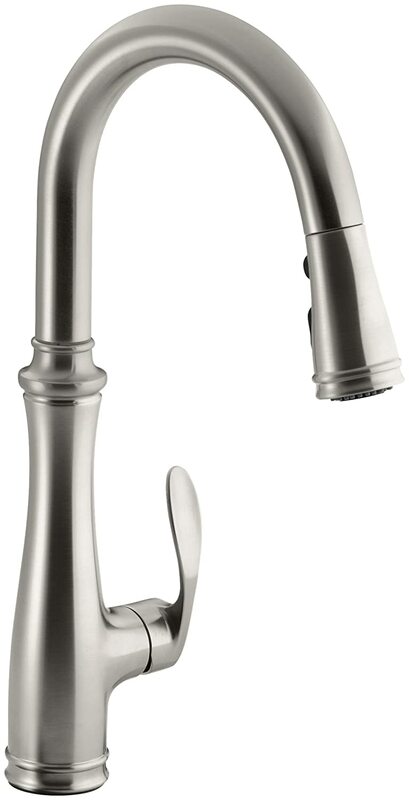 Delta Faucet 9178-AR-DST comes with five designs namely, chrome and arctic steel, Venetian and champagne bronze and stainless steel (classic), which fits any kitchen theme you might have. This one can easily fit any house theme and any kind of design the kitchen can have, it blends in any environment perfectly. For easier use and a cleaner look in your kitchen, Moen 7594SRS Arbor can be one of the advantageous kitchen faucets you'll find in the market. 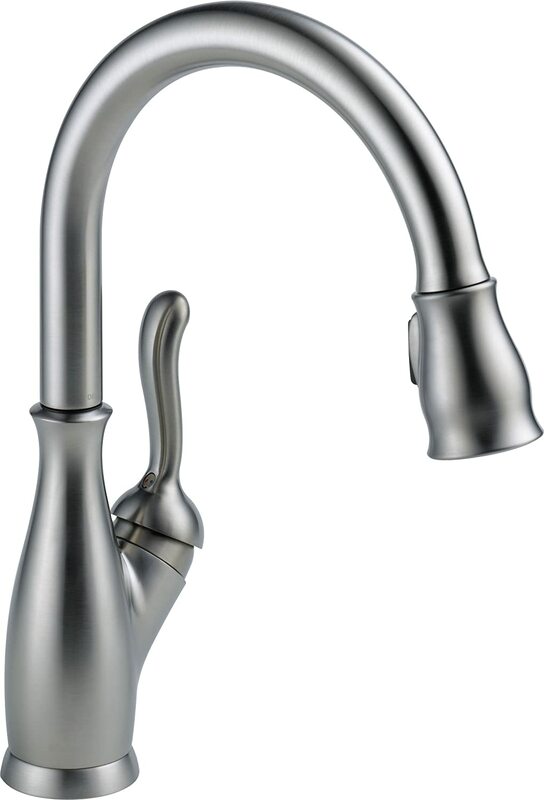 It's a stylish faucet with classy looking handle and a high arc (pull-down spout). For easy control and style, Kohler K-560-VS Bellera Pull-Down Kitchen Faucet can be the best faucet option. Kohler K-560-VS could be a vibrant stainless, polished chrome or rubbed bronze. This faucet is compact with ingenious and simple yet distinctive system enabling the faucet water to turn off and on. If you're looking for affordable kitchen faucet that comes with quality and functionality, you might want to check this one out. 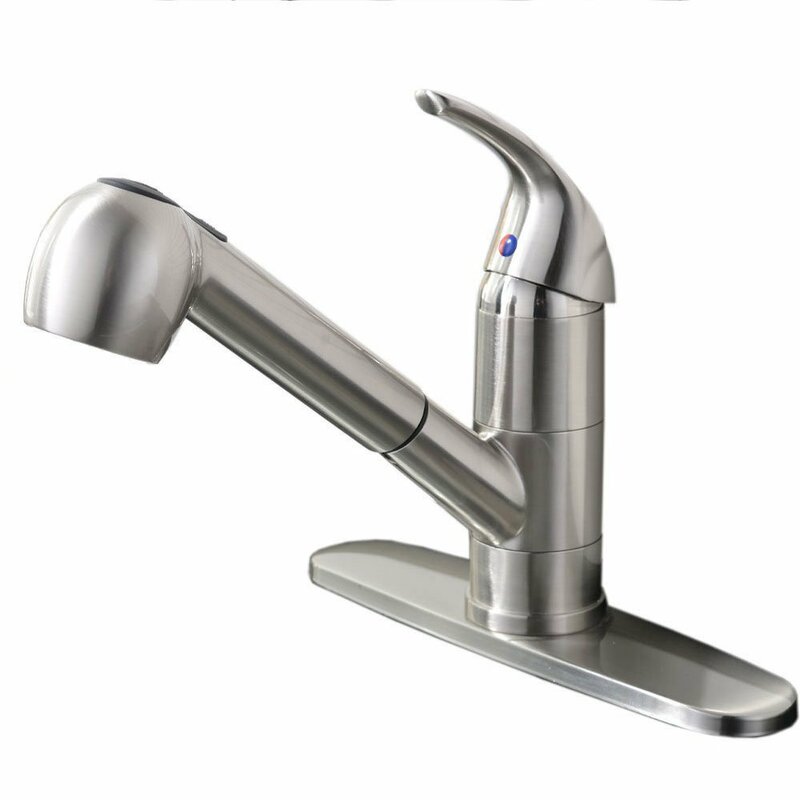 Ufaucet Commercial Stainless Steel is both applicable for commercial and household use. This is a favorable option considering its price and flexible features. It provides versatility with its single handle that is developed using stainless steel free of lead. Along with a kitchen faucet is a messy sink, with this one it will greatly help you with cleaning the sink and saving the time and effort. For homeowners who love easy control and installation, Best Commercial Stainless Steel Single Handle Pull-down Sprayer Kitchen Faucet may serve a surprising performance. It weighs about 6 lbs. With 23 x 10 x 2.5" dimension. This faucet offers 360-degree full rotation and can resist corrosion and tarnish. This faucet would take up less room so look for faucets which can be turned off having not to lose the last temperature setting. There is a need for it to be scratch-resistant even some staining might happen. This could be available in bronze, pewter, nickel, gold, copper and polished brass. This one covers the unused holes in the existing counter or sink. Those finger-friendly buttons on the side or on the top of the spray would allow you in terms of switching between stream and spray modes. This would combine the spray head and the spout with a swivel which increases the ability of the hose. Indeed, those longer hoses are a lot easier to be connected to the water supply. This would help the spout and the hose to properly retract to the base. The best one might have an activator in front as for easy location. These faucets are also great choice for cleanliness and convenience. Water will be activated by a movement sensor allowing you not to touch the fixture. Other designs could hide the activator and so making it hard to find once your hands are messy or full. For this faucet, consider checking the distance to the window ledge or back-splash since the rotation of the handle might hit whatever is behind it. They are easier to install and use and could take up less space too. But, they might not allow quite as precise temperature adjustments as the other faucets. Read here to know more the advantage of this type. The pullout spouse could come in handy once rinsing vegetable and the hose must be long enough as for reaching all the sink corners. But, for those with small sink, this feature might not be needed at all. Check it here to decide which one is suitable with your kitchen. They have separate cold and hot handles to the right and left. They have handles which could be part of the base plate or could be mounted separately and the sprayer would also be separate. The two handles would allow more precise temperature adjustments however they could be harder to install and might need both hands to adjust the temperature. These are common in most restaurant kitchens and could also be used at home. They are installed near the stove and also have articulated arms to fold away once not in use. These offer convenience but they should be connected to the water source behind the stove. They are considered as secondary sinks that could free up the space at the main sink. These faucets could be directly connected to an instant cold or hot water dispenser. But, space might always be a consideration too. Choosing the best type of faucet must depend on what you definitely need in your kitchen. Before deciding to purchase a kitchen faucet, keeping in mind some of the factors that should be consider will be a great help. And two of the main factors that shouldn’t be ignored are the features and design of the kitchen faucet. Look for a faucet that would allow you to pause the water flow as you work at the sink. Decide whether you want a pull out or pull down faucet based on your needs. Pull out designs could be a lot better for flexibility along with spray head. Pull down faucets are great to easily rinse dishes, vegetables and if you are to clean the sink. There could also be faucets that would use MotionSense or the touchless technology. These faucets are great if you cook at all times and your hands also need washing a lot often. These will also keep the kitchen hygienic. For a spray option, choose from the integrated design or have a side spray design. Additional hole for installation is also needed. The overall finish is also important. But also, there is a need to consider whether how easy the handle could be used as well. There are also few spouts out there that might not include swivel. You should think whether how much of the swivel you need. Look for the best faucet for your kitchen that would match the features and design you are looking for. Most people would install the faucet without having to look at the instructions properly making them miss something which could lead to one or two unwanted issues. To avoid this, there is a need to take your time. Just have all the needed tools and be guided by the instructions provided. There could be a buildup of mineral deposits inside once the water pressure drops suddenly. With this, you just have to simply clean the areas wherein lime-scale sticks. But for serious cases, this problem might be associated with the water supply. There is a need to be very careful once the faucet begins to show some signs of rust as its already formed inside so might affect the quality of the tap water. Wear and tear might also be observed if the overall finish starts to look a bit shabby or it could be hard to move the lever or the spray heads. This could be one of the reasons why changing kitchen faucet is observed by many. They might come in all forms. 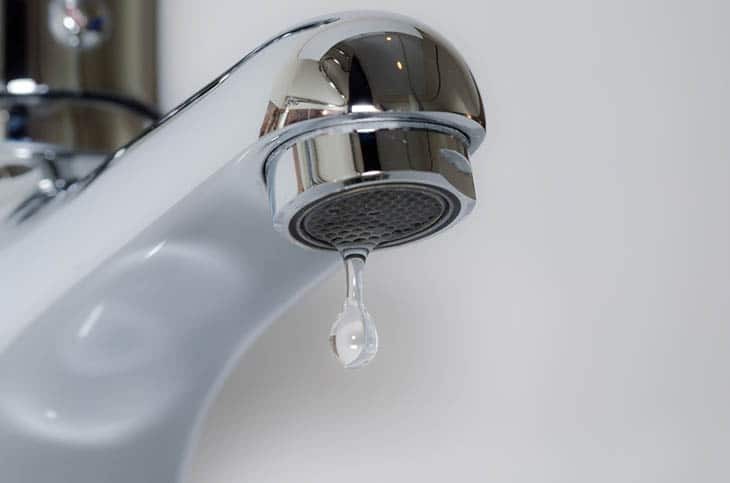 The faucet might be wet around the base of the spout or there could be an annoying drip or the water leaks out. If you will consider the expertise of a plumber as for installing the faucet then there will be an assurance of great job. But if you will do it yourself, look for a faucet that might be installed a lot easier. Replacing the kitchen sink and the faucet, install the faucet first prior to installing the sink. This will make it a lot easier to reach many things which you need to be tightened and connected. You might also need to work in tight spaces under the counter. Look for long water supply hoses if you want a smooth installation of the kitchen faucet. In addition are the fittings which could be tightened along with the screwdriver. These two will make the faucet a lot easier. Watch this video to know more about how to install faucets. Why there is a need to consider the water usage once shopping for a kitchen faucet? Well, there could be two reasons. First, the less water that you use the lower the water bills would be. And the second one is considered to be more ecological. Water is becoming more expensive and there could be a risk regarding providing quality tap water. With that, your water consumption or usage plays of great role whether which kind of faucet you should buy. Look for kitchen faucet that would help you save money as well as environmentally-friendly. How many holes or openings does the current faucet use? In most cases, the current faucet would either mount into a hole and would have a lever handle which would turn the water on and off. Or it would also mount into three holes along with the faucet, the cold water handle and the hot water handle mounted into their own hole. It might a fairly quick process or it could also take the better part of the day based on your situation. They do not rust but they appear like a rust one. Why do I have to dry the stainless steel sink after rinsing? Unless you have pure distilled water that flows from the faucet, there will be dissolved minerals as well as salts in the rinse water. Once you dry the sink after rinsing, the spots wouldn’t form. And from these given options, indeed the best choice to ever consider is the Delta Faucet 9178-AR-DST Why? It has the best features that you might be looking for in terms of a kitchen faucet. Aside from the quality it offers, affordability is also guaranteed by this product. And also, having the highest rating from the customers could say that this one is definitely a great choice. Finding the best kitchen faucets is never an easy task especially if you have your specific needs. With that, being guided with the right information and reviews, the process of looking for the one could be a lot easier and faster. And this video could help you find the best one in the market today. If you like the article, post your comments below and share it now!